It’s summer and the weather is great! Well, it’s summer where I am and chances are it’ll reach you pretty soon too. And when it does, you may want to create a backyard tropical paradise so you can get away from it all without spending any money of gas or hotel rooms. Well here are a few of tips to help you spruce up your backyard for cheap. And yeah, I may have overstated in the title a little bit. These summer yard prep ideas will cost you pennies it’s true—but actually quite a lot of them. Not a whole lot of dollars though, I promise! Craigslist: People take down their “old” privacy fences all the time and often list the fence panels as a free give away on Craigslist. Often these fences are in good repair but may look a little old—but hey, you want privacy right? Well privacy doesn’t have to come pretty and ugly can usually be painted. Reed fencing: Lowes and Home Depot both have rolls of reed fencing for about $22 for 16’. The reed fencing is not completely private, but if you install it at an angle it keep you pretty hidden. You don’t have to do the entire perimeter of your backyard, just a small area for sunbathing, grilling or laying on your hammock. Cheap furniture: A private backyard is great—but it’s even better when you have some furniture to enjoy. Here are a few ideas to help you score some cheap backyard furniture. Friends and family: If you hear friends or family members discussing the possibility of replacing or upgrading their outdoor furniture, then you should ask them if you can buy their existing set. You may even get it for free. Yard sales: Yard sales are a great source for unused or unwanted patio furniture. And you usually find very motivated sellers. Big Lots: If you have a little extra money and can buy your furniture new then you should stop by Big Lots. They have great outdoor sets, tents, grills and more for very low prices. Be sure to get some furniture covers too so that the weather doesn’t damage your new purchases. Potted plants: Buy some potted plants at any of your local home improvement stores. You can find some inexpensive pre-planted pots for $5-$10. It only takes one or two to really liven up your outdoor space. String lights: You may be able to afford a couple of tiki lights, but if you want a really inexpensive lighting solution just take out some of the old white or gold Christmas lights you’ve got in your attic. 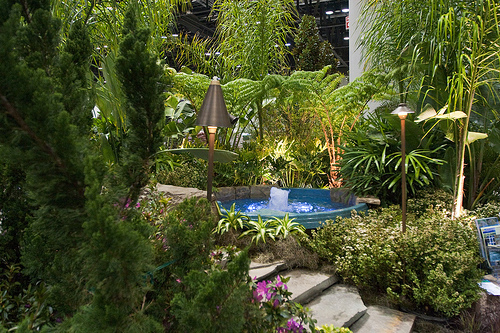 They add an enchanting feel to your backyard and are free! Any tips on how to get rid of mosquitoes? I am looking for the same information as well.